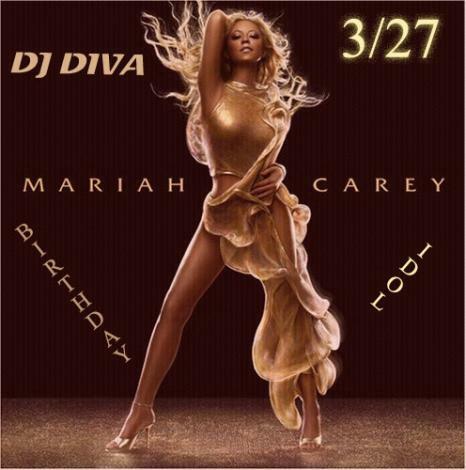 This Monday Mixtape is all about my birthday idol Mariah Carey. We all share a birthday with someone…and I do with Mariah! Mariah Carey has been an idol of mine for long time. We share the same birthday and although she is 4 years older than me..she has always provided me with the inspiration to follow my dreams. From her first song Vision of Love, her incredible voice range has captivated us for yeas. In the beginning of her career, I thought it was odd that she kept releasing “generic” versions of her songs and remixes which were always catchy and filled with the hippest rappers and producers in the business. Of course we can all see now that it was absolute genius from a business sense and it also provided Mariah with a chance to step out of the songstress spotlight, relax and just be herself. As an Aries woman, I commensurated with her very public breakdown and her fight to regain herself and her image. I am very happy for her continued success and I wish her a very happy birthday…which was shared by me! I love Mariah Carey so the mixtape was perfect.